A four-armed, three-eyed figure dancing with the right foot on a prostrate demon, Apasmara or Muyalaka, signifying ignorance, the destruction of which brings enlightenment. 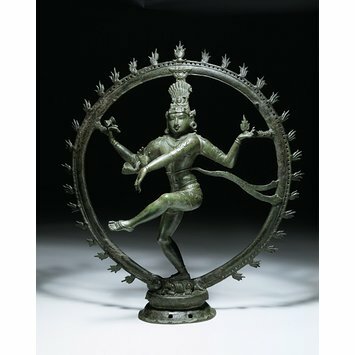 The figure is surrounded by a circular aureole of flames (jvala mala), symbolising the life of the universe. The front right hand is in abhaya mudra (giving assurance), and a cobra, bestowing protection, is coiled round the forearm; the rear right hand holds the drum (damaru: symbol of creation) by means of a cord which binds it to the back of the second finger; the rear left hand holds the flame (agni: the element by which the universe will be finally destroyed); the front left arm is stretched across the body in the dancing gesture, gaja or danda hasta. The hair is dressed close to the crown and surmounted by a fan-shaped headdress of Kondrai leaves (Cassia fistula L.) bearing a crescent moon, Datura flower, skull and cobra. Behind the head there is a flower-like siras chakra (disc for hanging garlands). The braided locks which originally flowed out to the sides are broken off and missing. A thin sash twisted round the waist has its ends flowing to one side. The costume consists of tiger-skin loin cloth worn with a girdle, the latter with beaded festoons. Other details include a multi-threaded sacred cord (one thread of which is divided at the chest); spiral keyura armlets; ear-pendants (makara kundala on the right, patra kundala on the left); padasaras on the feet, and a garter with bell above the right ankle. The image is mounted on a lotus pedestal with holes for attachment to a processional carrier. Traces of encrusted carbonate matter in crevices indicate a former period of earth burial. Bequeathed in 1935 by Lord Ampthill (Governor of Madras, 1900-1906). E.B.Havell, Eleven Plates Representing Works of Indian Sculpture Chiefly in English Collections, India Society, London, 1911, plate V.
K.N.Sitaram, "Indian Bronzes," Connoisseur, London, vol. LXIX, 1924, p.73. 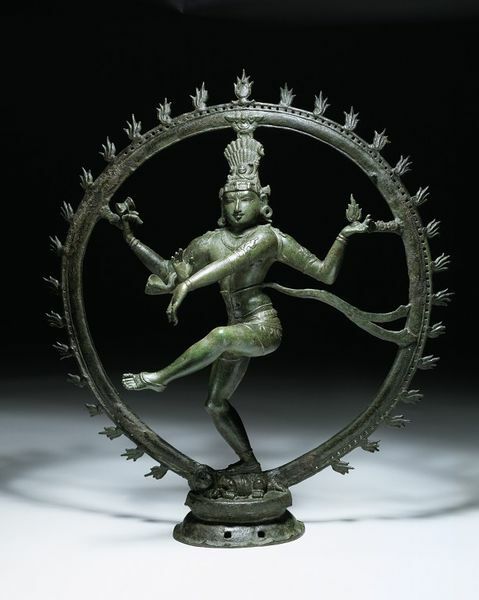 For Nataraja symbolism see A.K.Coomaraswamy, The Dance of Siva. Cat. of Museum of Fine Art Boston, pt.II 87-93. Exhibited: Art of India exhibition-1931 Burlington Fine Arts Club. Guy, John: Indian Temple Sculpture, London V & A Publication, 2007, p.105. pl.114. as the element by which the universe will be destroyed. An aureole of flames represents the life of the universe. Underfoot lies the dwarf of ignorance. Attribution note: Spectrographic analysis of the metal showed copper with more than 2% each of lead and tin; more than 0.2% of zinc, iron and silicone, and smaller traces of silver and aluminium. The aureole is reinforced with an inner hoop of iron which has swollen in process of oxidisation and split the bronze in parts. Iron is present along the entire length of the aureole including the section behind the prostrate figure at the base, suggesting that it forms a complete hoop inside the bronze. During conservation treatment in 1971-3 iron was reported to be visible in one damaged area of the hoop, which was subsequently treated.